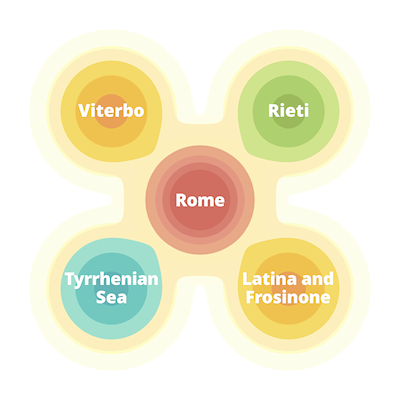 Histor­ically, the region of Lazio has often been seen as the black sheep of Italy in regards to wine production as its wines have never been extremely fashionable but very recently things have changed and quality has improved greatly. Sadly most of these wines are still difficult to find abroad, so Alessandra Andreani, aka The Winehippie, has contributed this useful guide to the local wines you may taste during your holiday in Lazio. Alessandra is a freelance wine expert and blogger. We are going to start with an indigenous grape: Malvasia del Lazio. This variety is part of a wider family originating from the Peloponnesus. Its name comes from Monembasia, a hilltop Byzantine fortress in an area where the grape was used for the production of sweet wines. The wines were then traded in the rest of Europe and became quite fashionable in Venice where the name was stretched to Malvasia. But the specific Malvasia we are talking about arrived in Lazio only in the 19th century thanks to Genoese merchants. The grape, also known as Puntinata, expresses at its best on hilltops sides and well drained soils. It is prone to diseases and tradi­tionally has been often blended with other varieties to increase its acidity but with the new waive of quality focused producers in the region, major replanting of this variety has happened resulting an increase of varietal wines. Malvasia del Lazio is mainly grown in the Castelli Romani area and more precisely in Frascati but it’s part of many DOC of the region, including the light and refreshing Capena Bianco Secco produced in the vineyards around our houses. The wine tends to have a golden deep colour with aromatic notes and a light musky pungency. In the mouth it shows notes of apricot, a light acidity and a soft medium body. In its dry versions it goes perfectly with the tipical Roman primi piatti; pasta alla gricia, pasta cacao e pepe or carbonara, but it also pairs extremely well with carciofi alla romana and chilled it can be a lovely aperitif on its own. It also produces extremely delicate sweet wines. A few inter­esting producers: Castel De Paolis, Poggio Le Volpi & L’Olivella. One of the major strengths of Italian wines, is to have a wide ampelographical range and a diverse production strongly depending on local traditions, but this also means that some local productions often remain unknown to many. The Nero Buono is one of those grapes, often underrated or even forgotten. It is cultivated in a very small area of Lazio, in the town of Cori , in the province of Latina , and distri¬bution and consumption are closely related to the area of origin. Despite this, and especially thanks to those producers that have focused on the peculiarity of the indigenous grape varieties to develop a new viticultural trend in the region, the Nero has been recently rediscovered. The vine has unknown origins, but it has been grown in the area since ancient times. The hilly terrain of volcanic origin of the Lepini mountains and the micro-climate, characterized by fresh air breezes that reduce the risk of mildew, towards which Nero Buono is particularly sensitive, are the best conditions for this variety that has found here its perfect habitat . If in the past it has been used in blend to reinforce the colour of other grapes, now several winemakers are producing it as a varietal wine, and the results are very encouraging. The wine has wild under-growth aromas and spicy notes on the nose, a good body and a vibrant acidity and soft tannins. When handled with care and passion the wine shows a good trend to an elegant aging with the development of liquorice and cocoa notes. It is an extremely pleasant wine with a good structure and a good partner for the local cuisine. Among the recommended producers: Marco Carpineti, Cincinnato cooperative and Poggio Le Volpi. It is time for a bit of sweetness…and Lazio produces a very inter­esting and little known sweet wine: the Aleatico di Gradoli. This wine is produced with 100% of Aleatico grape cultivated in the Northern part of Lazio, the area called Tuscia, but also in Tuscany, Umbria and Puglia. 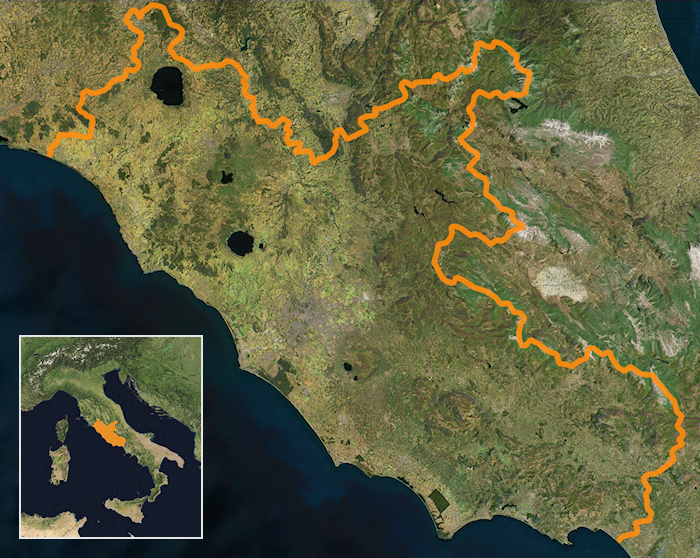 The DOC appel­lation was created in 1972 and covers various towns around Gradoli on the shores of the Bolsena lake. Here the soil is volcanic and there is an important breeze coming from the lake that creates a peculiar mesoclimate, which is partic­ularly relevant for the wine’s characteristics. This is a very small production that managed to survive thanks to the stubborn vine growers of the local cooperative, that managed to let the grape and the wine survive against all odds. The wine is beautifully dark red, deep and thick. The nose shows intense notes of red fruits especially sour cherries in jam. The mouth is warm and soft, velvety and rich. It’s sweetness matches perfectly the local patisserie. Unfor­tu­nately it is not easy to be found out of the area, so you will really have to go for a walk around the lake of Bolsena to enjoy it, and believe me…it will be absolutely worth it! On the occasion of Cantine Aperte, the most important wine festival of Italy, we decided to get the chance to write again about the indigenous grapes of Lazio. And today we are going red. The grape is Cesanese, an ancient local grape that exists in 2 different subvarieties: Di Affile and Del Piglio, the latter being the highest quality. Cesanese Del Piglio is cultivated in the whole province of Frosinone and more specifically in the towns of Piglio and Serrone and partially in the communes of Acuto, Paliano and Anagni on hilly soils of volcanic origins. This variety started to get a new lease in life in the last decade, attracting more attentions and obtaining the first DOCG of the region in 2008. The resulting wine has intense ruby colour. Its nose is full of forest herbs aromas, red forest fruits: mulberries, black­berries with a final almost sweet note. In the mouth it shows a good combination of freshness, depth and structure. Its tannins are round and velvety. It is meant to be drunk relatively young but can live a few years and develop a nice complexity. It’s the pride of Lazio and it matches brilliantly the local cuisine: lamb and bucatini all’amatriciana, but personally I like it a lot on its own. If you are around this weekend, and want to taste a good example of this wine, you can visit Giovanni Terenzi winery in Serrone. Once again we are here talking about an indigenous grape variety from Lazio. Once again it’s a white one, and its name is Bellone. This variety has been present in Lazio since ancient times; it was already known by the ancient Romans and Plinius quoted it in one of his essays. It is used in the blend of various DOC appel­lations of the region, such as the Capena Bianco, Frascati, Nettuno, Marino and a few others, but it is also vinified on its own especially in the southern part of the region in the coastal area of the Latina province. It finds ideal conditions in the area of the Castelli Romani on volcanic, light and deep soils where it shows a good palette of fruity aromas especially grapefruit and peach. It may also have some honeyed and almond notes. It often has high level of alcohol, and it is round and full in the mouth; for this reason it is often used for the production of Cannellino di Frascati. It wonderfully matches the local cuisine: young pecorino romano with fava beans (the roman tradi­tional food for the 1st of May picnic), but also sea fruits and lake fish especially if deep fried. As for the other white grape varieties of Lazio, it normally gives wines to be drunk young or in a couple of years. Bombino (or little bomb — as per its literal trans­lation) is a grape varieties that is widely spread in Central and Southern Italy, especially Puglia, Abruzzo and, of course Lazio where is part of the blend in the various Frascati appel­lations (Cannellino, Superiore, Superiore Riserva and Spumante). It’s thought to be coming originally from Spain but it has been cultivated in Lazio since ancient times. Its fortune arrived in the 60’s when, thanks to its good productivity and high reliability, it was often used to add acidity to the wines sold to Germany. These qualities are also the reasons for its nickname Pagadebit, mainly used in Emilia Romagna and literally meaning ‘debt payer‘! This grape variety is rarely a star performer and will never have a deep complexity but can produce quite different wines; from the dull, almost unfla­voured and uninter­esting ones resulting from high yields to the much more charming ones carefully handled on good soils with reduced yields that can show characters of medium ripe apple, chamomile and a touch of minerality. The best examples are often coming from Puglia, but the grape is also a very important part of the Frascati blend so if you want to taste it you’d better get a good example of this wine and possibly enjoy it on a sunny day in the lovely Roman countryside!